This young man is our new LGD in training. He is a 14 week old pyrenees/anatolian mix. I have been considering a new pup for a couple of years. Between the increasing boldness of the local predators and the increasing age of our current big white dog, Darla, I decide there was no better time than now. 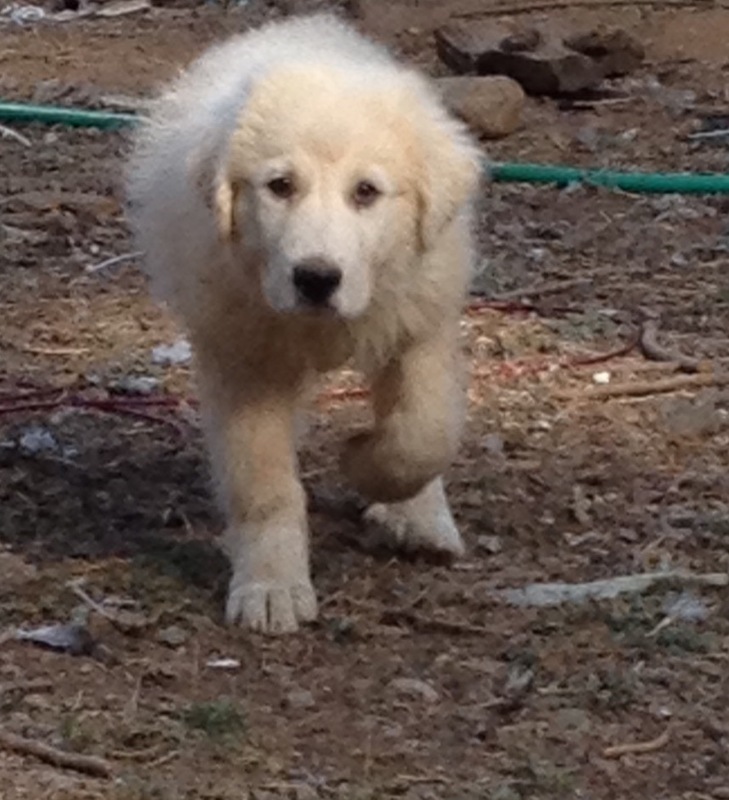 Part of my reason for hesitating is that I found the entire concept of raising an LGD pup a bit daunting. My other two came do me as adults after they were determined unsuitable for a typical household pet. I was extremely lucky in both cases. Both dogs took to their jobs with no help from me. The Guardian breeds in general are more difficult for me. They don’t tend to be people pleasers like the working breeds I own. They seem to have a different language, a different currency. Still, I eventually got things worked out with the other two, so I felt confident that I could with a pup. The majority of the training is being done by Darla. She has always been excellent with puppies. I take Aslan out of the pen a couple of times a day and let him hang out amongst the flock. He is a puppy and comes to bounce around and say hi, but already he is an independent little soul. He is fluid in his movement with the flock. The geese are obnoxious and like to yell at him, but for the most part nobody else pays any mind to him. He is part of the flock and not a reason for concern. Of course I realize he is still a work in progress. It will be quite some time before he is considered trustworthy. All pups go through phases. I’m sure he will get into his rough, playful phase soon. For now he will train under the watchful eye of Darla and myself . I’m sure soon enough he will have the experience and know how to raise a future big white dog.